Airplane storage comes in a variety of styles from single hangars all the way up to mutliple rows of �T� hangars. No matter what type of airplane hangar you store your airplane in be sure it has a �One-Piece� door by Schweiss. �One-Piece� doors are simple and sturdy, adding style and class to any type of airplane storage building. 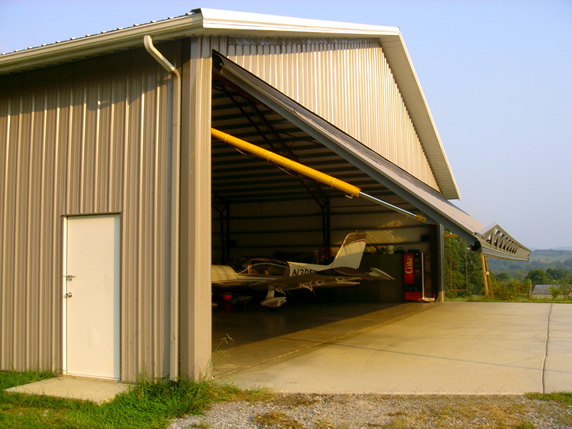 Schweiss �One-Piece� doors are custom manufactured to perfectly fit any airplane storage building. The Schweiss �One-Piece� Door has been chosen by airplane building owners throughout the world, who are consistently recommending us to other airplane storage building owners. That is why Schweiss is the leading supplier of �One-Piece� doors for airplane hangars across the globe.